The gold and beads don't show as well as we'd like but at 9pm at night with eyes drooping and a holiday to finish packing for it's the only chance I'd get at a photo!! Well done. Know you son will love it. Well done, Jo, looks lovely! WOW! It look really great. Well done. OH MY !!! All done-- thats great, so how does your son want it finished? framed?pillow-NOT? wall hanging??? Glad you were able to get it done before holidays. not you can concentrat on something for you!so what do you have plannned to take it place in WIP??? something already kitted and waiting in line? My son is going to go thru my totes and look for my magnifiying(w/light)glass...need it so bad..
have a good holiday, stay safe, stitch lots,enjoy!!! Your dragon turned out so cute. I'm sure son is loving it. He is fantastic, love how he pops on the red background. Congrats on a finish! I'm sure one little boy is thrilled! Congratulations on the finish. I bet DS2 is thrilled it's finished. Enjoy your holiday. Wow what an amazing finish,it looks fantastic I bet your son is thrilled to bits. He's gorgeous, Jo - your DS must be thrilled to bits! Well done! You have done a wonderful job and I bet DS will just love it. He's absolutely gorgeous, Jo. You did a fabulous job stitching this great dragon!! Congratulations! That dragon is amazing!!! I've never seen this design before - great fabric you chose! Congrats on the finish, Jo. It looks adorable. 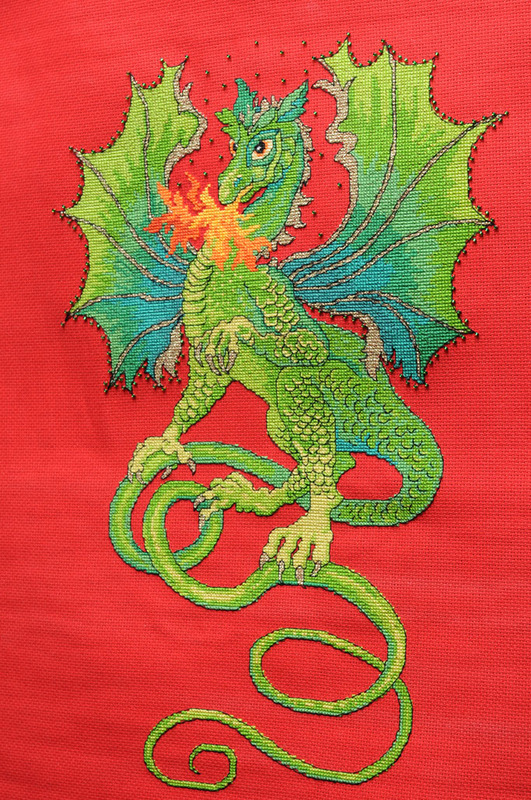 Just joined StitchSpecialists, love your finished Dragon! I am currently working on The Castle by Teresa Wentzler. I am doing the red version instead of the green one. He looks fabulous, well done!